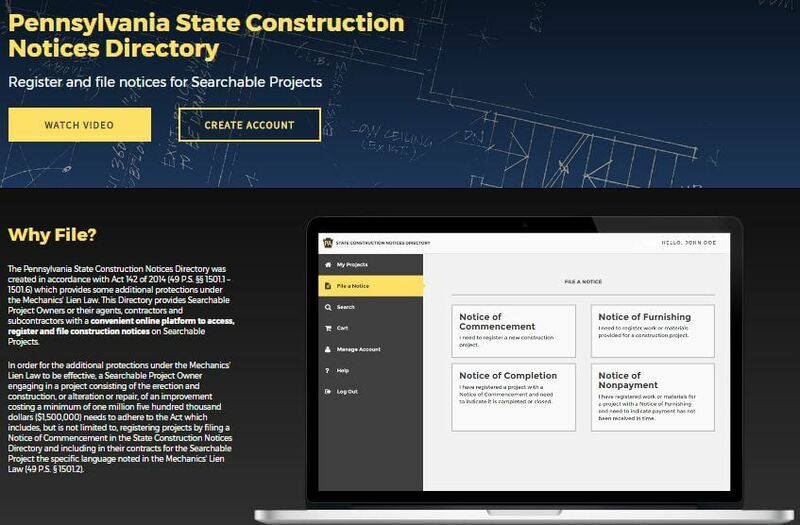 The Pennsylvania State Construction Notices Directory, which was made operational on December 31, 2016 and made possible through revisions to the Mechanics’ Lien Law of 1963, is a useful way for individuals involved with a construction project to track the project’s progress from start to finish and is a helpful way for key service providers, like subcontractors, to put project owners on notice in the event where they are not timely paid. Moreover, the Directory provides for a means to preserve a subcontractor’s right to file a mechanics’ lien where a subcontractor files a Notice of Furnishing with the Directory. However, a subcontractor who fails to file a Notice of Furnishing within a certain timeframe will lose their right to file a mechanics’ lien. So, what must one know to take full advantage of everything that the State Construction Notices Directory has to offer? • The name, address, and e-mail address of a surety for the performance and payment bonds (if applicable). Once the Notice of Commencement is filed with the Directory, and once work commences or services are rendered, the subcontractor performing work must, within 45 days of first performing work, file a Notice of Furnishing with the Directory. This step is extremely important because a subcontractor who fails to do so will forfeit their right to file a lien claim, and this can present serious issues if the subcontractor faces non-payment issues. When the project has come to an end, which would be marked by the issuance of an occupancy permit or by the cessation of all work for 30 days under certain circumstances, the project owner may file a Notice of Completion within 45 days of the point marking the completion of the project. When the Notice of Completion is filed, subcontractors who have filed a Notice of Furnishing will be notified of the project’s final filing. While the thought of non-payment is frustrating in and of itself, subcontractors and others rendering services will be well-advised to know how to deal with a non-payment situation far in advance. The amendments to the Mechanics’ Lien Law provide that subcontractors who have not received full payment for work, goods, or services relating to a project may file a Notice of Nonpayment with the Directory for informational purposes. However, the failure to file a Notice of Nonpayment will not automatically limit a subcontractor’s ability to seek a claim. On the other hand, the same is not true for a subcontractor who fails to file a Notice of Furnishing after starting work on the project. Once the Notice of Nonpayment is filed, and assuming the subcontractor has filed a Notice of Furnishing, the subcontractor’s ability to pursue a mechanics’ lien through traditional legal measures remains intact. Amendments to the Mechanics’ Lien Law provide additional protections for subcontractors. Specifically, it is unlawful for a project owner (or their agent) to require that a subcontractor not file a Notice of Furnishing as a condition of entering, continuing, or maintaining a contract. A project owner (or their agent) who forces a subcontractor not to file a Notice of Furnishing commits a second-degree misdemeanor. In the event where a subcontractor does not file a Notice of Furnishing because of a project owner’s unlawful conduct, the amendments provide that the subcontractor continues to have the right to file a lien for work and services performed. In addition, the affected subcontractor may be able to recover damages from the violating person for any loss or injury sustained because of the violation. While it is always helpful to read up on the latest developments that may affect your interests, it is never too early to consult your attorney, especially since they will be in the best position to give you specific legal advice and recommendations as new court opinions interpreting this law become available. The opinions expressed in this article are for general information purposes only and are not intended to provide specific legal advice or recommendations. To learn more about how to preserve your lien rights when working on your project, please contact Michael G. Louis at 610.840.0228 or [email protected].